A novel inspection technique for Fiberglass Reinforced Polymer (FRP) that aligns with the systematic approaches and consensus API codes for evaluating steel piping and vessels was discussed in an article I published in the May/June2017 issue of Inspectioneering Journal . The technique obtains non-destructive ultrasound readings from the outer surface of the FRP. This article provides a case study of an actual inspection and evaluation of an FRP column. The client used a retired asset so that the non-destructive and non-intrusive results could be verified by destructive testing. The ultrasonic equipment that was used for these inspections is shown in Figure 1. The ultrasonic equipment consists of a flaw detector and a 500 kHz transducer with various delay lines for impedance matching. Other tools such as measuring tape, brushes, scrapers and mirrors will allow inspection and light cleaning of outer surfaces as required. 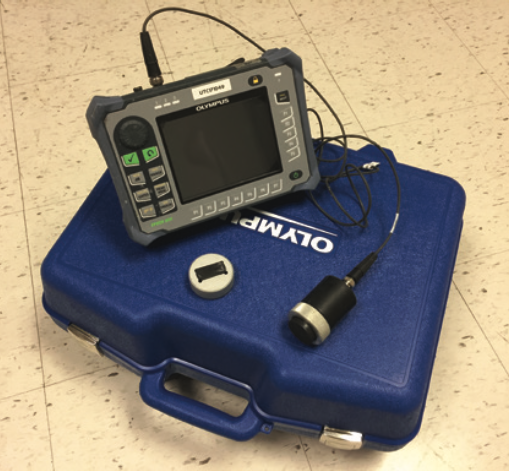 For conventional ASME and API ultrasonic inspections of metallic assets, many flaw detectors currently on the market provide on-board analysis capabilities for flaws and defects. As of this writing, on-board capabilities do not exist for FRP, so the flaw detector must be capable of saving A-scans and exporting the raw data and settings for analysis by external software.